You could a make a case for any of the top five seeds in this tournament to win it all at this year’s Elite-Select Challenge. Pittsburgh Temper, Seattle Sockeye, Chicago Machine, Michigan High Five, and Toronto Goat are all in a position to vie for a semifinal appearance and bring quite a cast of players to the table. There are some truly imposing matchups in the height category and not just on the top five teams. There all also some huge bid implications on the line this weekend for teams in the Southeast, Southwest, Mid-Atlantic, and North Central regions. #5 Pittsburgh Temper and #6 Seattle Sockeye headline the men’s division this weekend after kicking off their seasons at Pro-Elite Challenge. Temper bested Sockeye and asserted themselves as the potential Mid-Atlantic favorite in Colorado as the tournament’s bottom seed. The tables have turned for Temper this weekend, as they are the top seeded team coming into competition. Temper is a very balanced team this year with a backfield driven by marquee handlers like Pat Earles and Jonah Wisch and a defensive line that showed off good efficiency in Colorado. Temper runs vertical sets and runs them well. On defense they have a strong group of seasoned defenders with Marcus Ranii-Dropcho and Michael Ing headlining a very talented and confident crop of players, and Tyler Degirolamo is problematic element for opposing defenses to contain. They have a chance to reinforce their early season statement this weekend and tune up their lines before competing at Pro Champs on Labour Day Weekend. The big Saturday matchup to look out for in Pool A will be Temper taking on regional rival #15 Philadelphia Patrol. Whereas Temper appears to be developing into the Mid-Atlantic favorite this season, Patrol has yet to make its true statement as a contender for that spot. Patrol is young, and hasn’t quite demonstrate the potential in their roster. Patrol utilizes a variety of vertical sets and possesses the wrinkle of having two their offense driven by two lefties. Veteran Billy Sickles and rookie Connor Russell, who proved their reliability in the backfield in Colorado, and cutters Himalaya Mehta and Vincent Reydams get to try their hand against the likes of Tyler Degirolamo. That matchup will be telling as far as where Patrol is in their development. If Sockeye is hunting to make a true statement during the regular season, this might be the best opportunity they’ll get before the Series. This is still largely the same team as last year, and if Sockeye can play with the kind of efficiency that has been a longtime trademark for Seattle, they’ll be a nightmare to match up with this weekend. Dylan Freechild and Jacob Janin are capable of a gear that is a handful to guard. If Sockeye catches fire on Saturday, it’s hard to imagine teams challenging them until the bracket. They have the talent and the defensive acumen to lay waste to anyone in their pool and go toe to toe with the other tops squads at the tournament. Matt Rehder and Christian Foster set up their defense with deep pulls all weekend in Colorado. There’s a final rematch in the making for Sunday if Sockeye and Temper stay strong in the bracket. #8 Chicago Machine may have missed the semis at the U.S. Open and will not be bringing a full squad this to Elite-Select. Rather than going full blast with a complete roster, Machine is still in the process of building towards later in the season. They will be missing a significant portion of their roster especially on defense due to injury. Travis Carpenter and Great Lakes college Player of the Year Jeff Weiss will be stepping up to help fill some of the roles on offense. Pawel Janas has continued to thrive as Machine’s center handler and that isn’t showing any sign of changing. Machine will have another huge opportunity to compete against the top teams at the Pro Championships, and Elite-Select will give their younger players an opportunity to test themselves against teams that are at a different stage in their development. Meanwhile, further down the ladder in Pool C, there’s also a case to be made for #12 Madison Club. 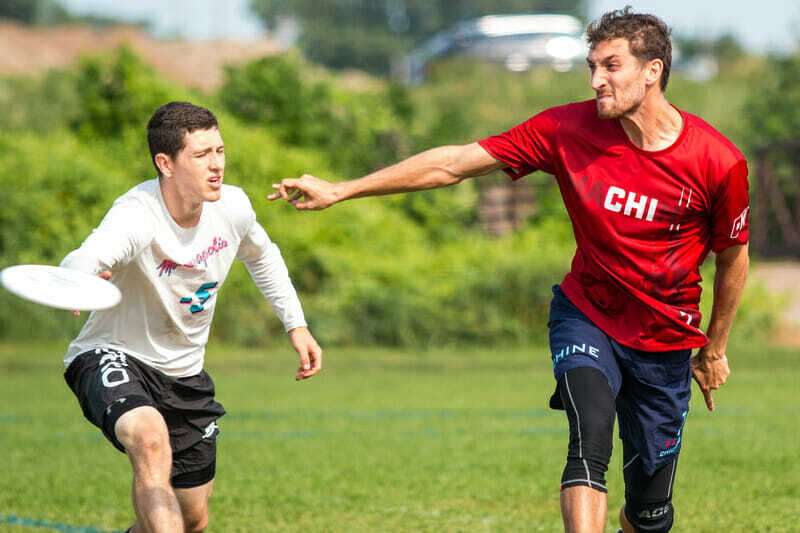 With most of the roster coming in hot off of an AUDL championship, Madison has some momentum to ride through this weekend. Their results from Pro-Elite Challenge suggested the potential this team could have on Sunday. While they dropped their game to Sockeye pretty badly on Saturday, they put up a good win on Doublewide and lost by one to High Five. With Machine missing some personnel this weekend it’s more than reasonable to expect a resurgent Madison Club Squad to take the pool. Capping off the top seeds, there’s plenty of intrigue at the top of Pool D with #11 Michigan High Five and #2 Toronto GOAT. High Five showed great resilience in their season opener at Pro-Elite and overcame multiple high pressure situations to reach the semifinals. They have an experienced core centered around some truly excellent throwers. GOAT in the meantime has yet to take the field outside of Club Worlds. With some players missing for Canadian Nationals, it’s hard to gauge what GOAT will bring to the table this weekend in the way of personnel. That said captain Thomsen McKnight expressed confidence in GOAT’s ability to set themselves apart from the pack this weekend. The last two strength bid spots are currently held by Truck Stop (15) and Patrol (16). If Patrol wants to truly insulate themselves, a big win over Turbine (sitting just outside at the 17 spot) and Condors (22) wouldn’t hurt. Turbine and Chain Lightning both could have a shot at a strength bid if they can sustain their performances this weekend. So far they’ve both gone undefeated but they will require A+ performances against a good field. Turbine will need to beat Patrol and Condors and play tight against Temper, a tall task for Saturday. Chain also faces a similar uphill climb against GOAT and High Five. High Five needs to be very careful not to lose their grip this weekend with so few games to account for. While not expected to fall out, it sure would make for a compelling Regionals if High Five had to go through Machine. Indianapolis Brickyard is essentially in the same boat as Turbine. They’ve got a tough draw with Sockeye at the top of their pool. A tight game against Sockeye and convincing wins over Inception and Brickyard are needed for Guerrilla to secure a bid for the Southwest. Condors are in a slightly better position with fewer games but still need to play very well. A close game against Temper and solid wins over Patrol and Turbine wouldn’t hurt. Madison Club is in a similar situation to High Five’s. Prairie Fire will need to put on a big performance if they hope to knock on the door of the top 16. Impossible? If their 14-4 loss to Rhino Slam at Select Flight Invite is indicative of how they match up to the top teams, that’s not a good sign. They’ll need to hit a different gear early this weekend to keep their chances alive. Comments on "Elite-Select Challenge 2018: Tournament Preview (Men’s)"